DOYLESTOWN (PA) – Five members of the Delaware Valley College football team were recently named Division III preseason All-Americans by USA College Football as seniors Rasheed Bailey (wide receiver) and Aaron Wilmer (quarterback), juniors Ken Kenner-English (linebacker) and Danny Wynne (safety), and sophomore Josh Wallace (offensive lineman) were recognized. All five earned all-Middle Atlantic Conference (MAC) honors at the end of last season as they helped the Aggies finish 7-4 overall (6-3 MAC) and reach the Eastern College Athletic Conference (ECAC) Southeast Bowl game. Bailey led Delaware Valley and posted career-high numbers is all receiving categories in 2013 as he hauled in 51 passes for 977 yards and eight touchdowns. Wilmer, a three-time all-MAC honoree, started nine games and the signal-caller completed 153 of 269 passes for 2,113 yards and 15 touchdowns. He also rushed for 366 yards and three scores. Kenner-English was second on the team in tackles with 82 (49 solo). He led the way with eight pass breakups and added a sack as well. Wynne paced the Aggies with 112 total tackles, including 68 solo stops. He also added thee pass breakups, two forced fumbles, one interception and one blocked kick. Wallace, a left guard, paved the way up front for a Delaware Valley offense that averaged 30.8 points and 425.9 total yards per game. 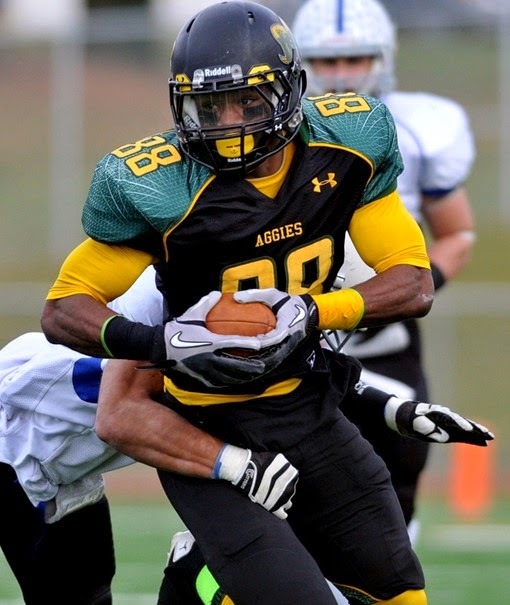 Delaware Valley opens the 2014 campaign on Saturday, September 6 (1:00 p.m.) when it travels to Montclair State University for a non-conference game.